What does being a Pastor have to do with the Disabled? I’ve thrown the names of Stanley Hauerwas and Eugene Peterson around quite a bit of late, but now I bring them together into one post. It’s lengthy, so I understand if you abandon ship now. But if you take the time to stick with it, contribute to the conversation when finished. I attended a lecture by theologian and professor Stanley Hauerwas a couple of nights ago in which he spoke on the topic of disability. His paper was entitled, “Disability: An Attempt to Think With.” The with of the title is the key word because it stands up against the notion to think about the disabled. In the former, the disabled are no different than those who are not, whereas in the latter the disabled are something other than those not disabled. Is it a minor detail, simple word play, insignificant minutiae? I don’t believe it is minor or insignificant. Theologians can, at times, delve into a world of intricacies and details that have no apparent value, or better, contribution to ‘everyday life.’ This distinction, however, is critical in understanding ourselves, disabled or not, as no better than another. Talking with the disabled requires an interconnectedness of love and union. There were plenty of things Hauerwas said that flew well above my comprehension, but his point was made nonetheless. His conclusion was that the disabled do not have a ‘problem,’ which is the category of which we prefer to speak because problems have solutions. To speak ‘about’ the disabled means to speak of a solution. To speak ‘with’ the disabled means admitting and acknowledging our commonalities and, more specifically, naming them as persons rather than problems. So in a sense, being with the disabled seems somewhat hopeless because there’s not a problem to be fixed. As I listened to Stanley speak I couldn’t help but notice the striking similarity between what he was saying about our disabled brothers and sisters and what Eugene Peterson says about the body of Christ. Part of what has been a staple of Hauerwas’ writings is the theme of story. We’re a part of a story, THE story of God. Being named and loved draws us into the story together. This is the same point Peterson makes in his memoir in regards to the congregation. Peterson writes of helping people understand the story into which they’ve been written and are participating, but to do so requires talking with people, rather than about or at them. As Peterson matured in his pastorate, he recognized his tendency towards treating people as problems to be fixed. After all, if there’s a solution, there is something measurable. “I did it. I fixed it. I fixed him/her/them.” To have no solution is a helpless, sometimes hopeless feeling. Such is being a pastor. Such is being with the disabled. Peterson confesses that by “reducing them to problems to be fixed, I omitted the biggest thing of all in their lives, God and their souls, and the biggest thing in my life, my vocation as pastor” (The Pastor, 140). The congregation is not a gathering of people over whom the pastor is charged with helping fix their problems (You may want to read as follows: MY pastor is not charged by God to fix my problems). That is a market-driven way to see this messy, unkempt vocation into which many are called. Problems have solutions. People have souls. Solutions are tidy. People are not. According to Peterson and Hauerwas, then, what’s frustrating about being a pastor is the same thing that’s frustrating about being with the disabled, namely, there are no solutions but souls. Will we, as pastors and as people of God, commit to being with and speaking with one another for the long haul? Stanley closed by pointing out that to give greater honor to those parts we think less honorable will mean we don’t get as much stuff done in the process. It takes time to be with, rather than to talk about and figure out solutions. Will you join me in committing to get less done for the sake of being with? Nothing fancy. Not superfluous. To the point. But she made the connection between the strength found in unions and the strength found in God and the numbers of His church in a seamless move. One reason America united when the tragedy of 9/11 occurred was because it drove people to seek a strength greater than the individual. I thought more about the notion of strength in numbers in relation to the start of football season and the madness that ensues. That a 45-year old man will paint his face or a mother of four will dye her hair and wear a ridiculous hat in support of her favorite team is further witness to peoples’ desire to be a part of something bigger than themselves. 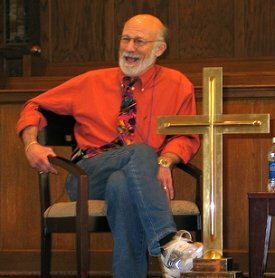 I had the privilege in California to sit down with Stanley Hauerwas and a few other students at Azusa Pacific University and ask any questions that came to mind. I asked the first question: “Dr. Hauerwas, what do you think is the number one issue that people in the church are dealing with?” Answer: “Loneliness. What do you think it is?” Answer: “Your answer sounds good to me.” I thought about it, and it’s true. Many people, even in masses, are lonely. Even on facebook, people are lonely. There is a pervading sense of loneliness in the lives of those who sit in pews or cushioned seats week in and week out. How are we speaking into that loneliness? Outside of the church are millions upon millions of people who go to work, play, spend time with friends and family, but they too are lonely. So they and we together scream alongside 80,000 fans at a stadium. We get silly over someone scoring a touchdown or sinking a putt. 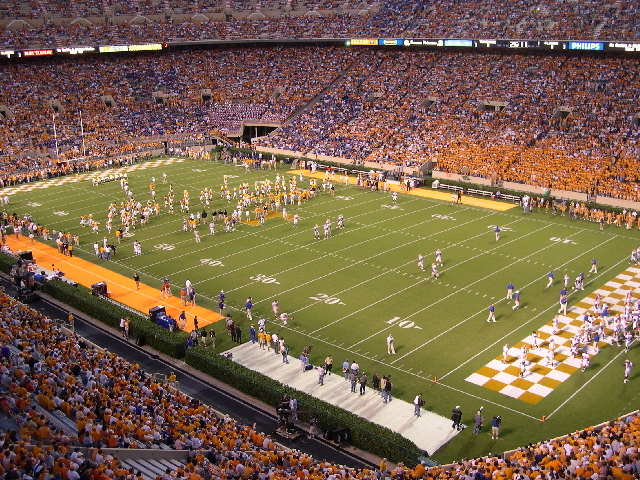 We’ll wear team colors–and if you’re like me, you’ll wear the colors of a school you never even attended. As a follower of Christ, the union of which I am a member is called the “great cloud of witnesses,” those who have gone before in the pages of God’s narrative, a story still in process. Next time you find yourself yelling for your team or when you see others doing so, I hope you will bear in mind to what reality such action points; namely, that we were created to be a part of something bigger than ourselves. We’re called to be caught up into a story that doesn’t make sense if ‘I’ or ‘you’ are the primary characters.